As the holiday season is quickly approaching, we thought we would share the top outdoor Christmas decorations, and cover a few safety tips when it comes to decorating your home. Every year, about 14,000 people are treated in hospitals due to injuries related to holiday decorating. From sprained backs to unfortunate falls, it’s important to really know ‘how to decorate’ for the holidays, all while still having a blast while doing so. Christmas lights are often the first thing people want to decorate their home with, and why not? They’re a classic! With so many different types of bulbs, colors, and sizes you can really incorporate your personality into decorating. Secure lights with proper holders, or try using clothespins. Use hot glue to hang lights on bricks. Typically people use a GFCI (ground fault circuit interrupter) outlet, but you can also buy a portable outdoor unity from a home store. Keep extension cords out of the way and organized, and make sure they’re outdoor safe. Tape them down, especially across walkways or driveways. Make sure your lights are waterproof. Cut slots on opposite sides of an old Tupper ware container and place the joining plugs of extension cords in the container. With the lid on, rain will be less of a concern. Net lighting is a great way to cover bushes and shrubs. Saves the time of having to weave lights through branches. For light holders, try these! 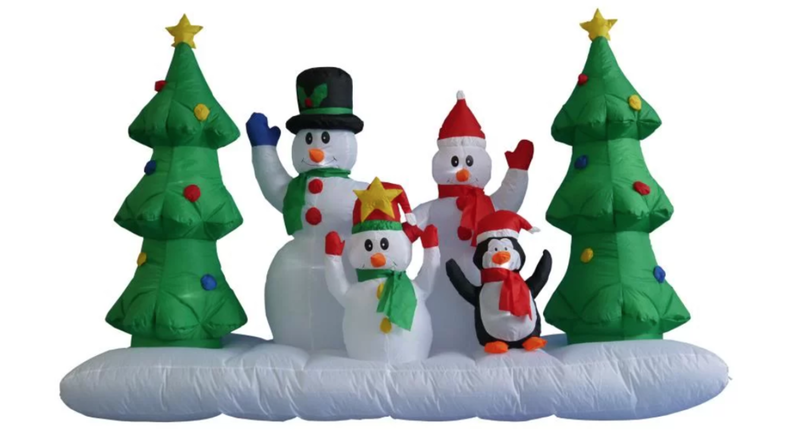 Over the last several years, inflatable decorations have grown into a staple for a lot of homes around Christmas time. Santa trains, sleigh and reindeer, penguins, polar bears, Christmas trees, snowmen, and even some of our favorite characters like the Grinch, Olaf, and Mickey, and so much more can adorn your lawn. Make sure the area you’re planning on placing the inflatable has enough space, and is clear of debris. Take a few minutes to look over any included instructions, as most inflatables come with the necessary tethers, stakes, or leg stands that your inflatable may need. If the easy to follow instructions say certain parts of your inflatable need to be secured, make sure they’re secured. Some of the tethers may need to be attached after it’s inflated for the first time. Every inflatable comes with a built in fan so that once plugged in, your inflatable will self-inflate to the full Christmas glory. Wreaths have been around for hundreds of years, and are a staple when it comes to Christmas decorating. They’re easy to hang, they’re festive, and you can get crafty and make them as unique as you are or you can purchase one in a variety of styles, sizes, and materials. Depending on where and how you’re hanging your wreath, you want to make sure whatever the wreath is hanging on is secured. Whether that’s a hook or ribbon, make sure it’s not going to break or rip. Make sure it’s outdoor safe if you’re leaving it outside. If you’re hanging one from a window, or several, make sure the hanger is secure and good to go. Want to give the illusion of floating wreaths? Try one of these magnetic wreath hangers. Learn how to make these here! Christmas time is a great reason to get crafty, and create something all your own. 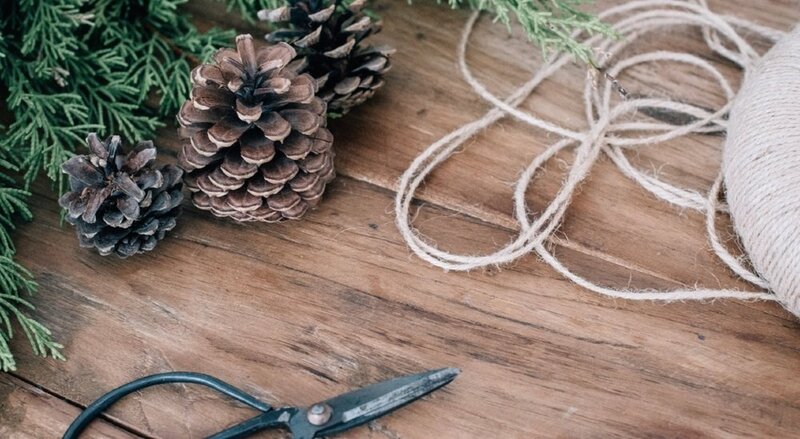 From cement block ‘gift boxes, to sleighs, and even oversized ornaments, reclaimed wood plank trees, or even pinecone masterpieces, DIY crafts can add to your home’s Christmas feel. Make sure your craft is as outdoor safe as you can make it. Use a sealant, opt for a sturdier material, or use a better holding glue. Whatever your craft, be sure to do a little research on how it’ll handle outdoor weather. It’s also pretty common to see several Nativity Scenes set and lit up at Christmas. Some are silhouettes, while others are full size figures. You can also find some unique decorations, or as we’re calling them, sets. Such as the Grinch and his dog, Max, or some large scaled Nutcrackers, maybe some reindeer statues, or a giant Gingerbread house! Make sure everything is as secure as it can be. Whether that’s with stakes that go into the ground, or using tethers, it’s important to make sure none of your Christmas decorations can get picked up by wind and carried away. If you use any lights in the ground, maybe to shine light on your Nativity set or signs for Santa, make sure you keep the extension cords organized and as out of the way as possible. 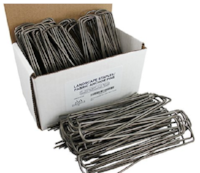 To keep your extension cords flat and organized, you could use garden, or landscape, staples (sometimes called stakes or pegs). Don’t place your tree near your fireplace. If you do, when you use your fireplace, keep a close eye on the tree and know where your fire extinguisher is, and how to use it, just in case. If you have a real tree, make sure you water it. Be smart when it comes to candles. Keep an eye on them. Candles start almost half of all fires around the holidays. Invest in good power strip instead of stacking plugs on top of each other. Decorating for the holidays is always a great time of year, we just want you to be prepared and know some safety tips!